Debussy's music was considered by French society to be not quite acceptable and, in one case, outrageous. The Belle Époque, however, brought revolutionary changes in music, art and writing. Debussy was among its leaders, and his inﬂuence had a very long reach. Dance workshop - no experience or partner needed, devoting our time to a Breton dance -the "Pach Pi". Bal - a time to practise your moves, not just the dances of this month, but others we have covered to date guidance will be given where necessary. As part of the Cathedral Quarter Arts Festival Christine Bovill, Scotland’s Little Sparrow and multi award-winning songwriter and performer returns to Áras Mhic Reachtain with her triumphant show Piaf. Bovill is the world’s best Piaf performer! No pretence. No gimmicks. Simply a voice. Pure and majestic. Singing of life’s triumphs and tragedies, resisting the temptation of retelling her life story, Piaf focuses instead on the music. Tickets £10 - MORE THAN HALF ALREADY GONE! To purchase tickets click here. Our friend Jane Coyle returns to the Cathedral Quarter Arts Festival with a new play 'Both Sides'. It is a development of 'Me Here, Me', the Beckett-inspired monologue which was at CQAF last year. You will see a big difference now that a companion piece - 'Before Before' - has been added. 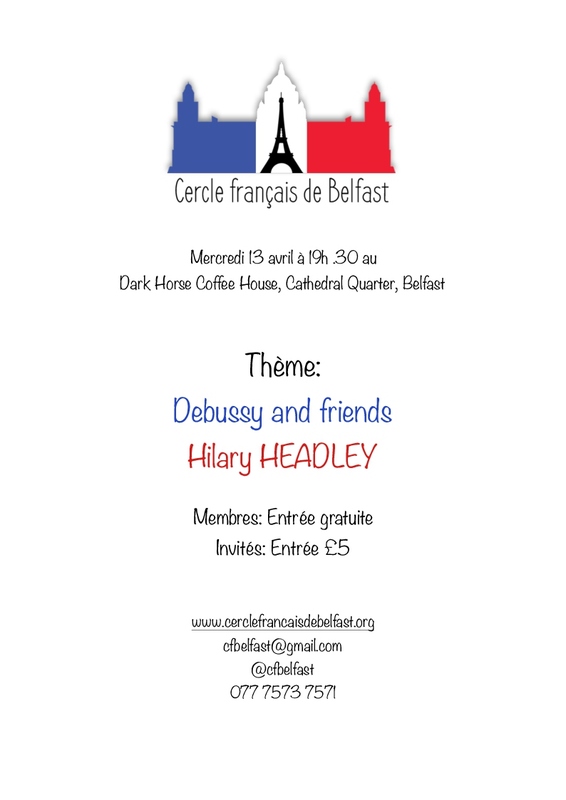 The two musicians, Mark and Annette, will be involved again playing their atmospheric French dance music. For further details and to purchase tickets click here. 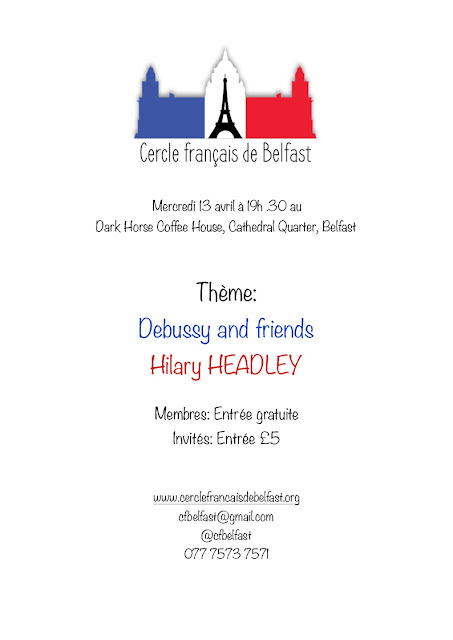 When going to press with our programme we still had not settled on the date for our annual dinner so you might like to note in your diary that this year Cercle Français de Belfast's Annual Celebration Dinner will take place on Wednesday 31st May.